The Get-Growing team gathered for probably the last time this week to reflect on the achievements of the three year project and to identify ways forward from here. We are really grateful to the National Lottery for their support of this project and of course to the Newtown College for making the Pen Dinas premises available to us and for the people of Newtown and surrounding area for their support enthusiasm and involvement in the project. Local food hub and veg box scheme; a nursery selling edible, ornamental and native plants; as well as a raised bed enterprise, making high quality box raised beds for sale from local larch timber. There are lots of opportunities for involvement and anyone interested in growing, or any other aspect of the project should get in touch to find out how they can become much more involved, With key project members moving on to new projects there will be enhanced opportunities for involvement. Here is a slideshow with images of the Newtown garden mainly from July 2014 and Feb 2015 at the completion of the project. This web site is no longer updated. The three year lottery project has now ended. 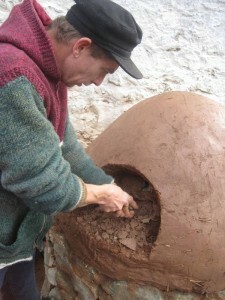 To see the latest project info and blog visit or Cultivate website. What’s cooking in the new Llanidloes community food garden? Wiith lots of help from local volunteers. 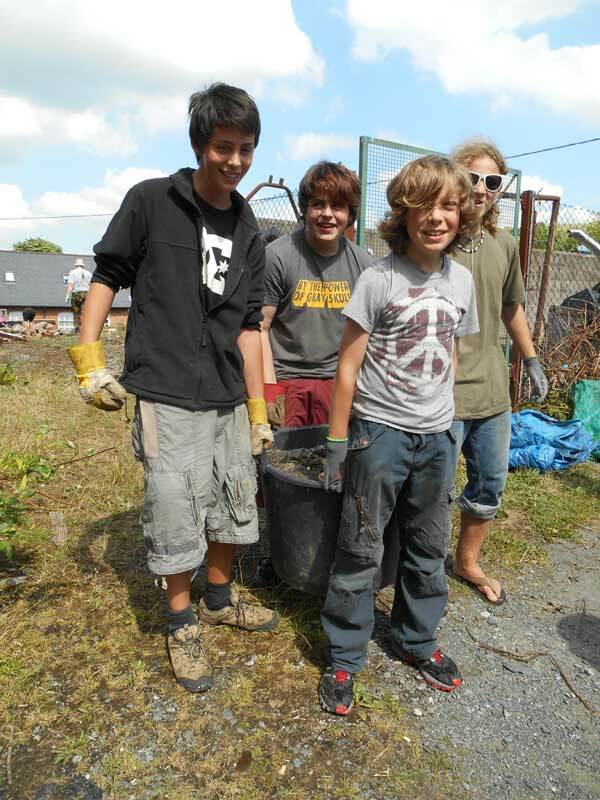 In association with the Llanidloes Scout Explorer group the Get Growing project has just been awarded £1000 from the Russell commission youth led grants scheme. This will fund the construction of a sunken seating area and a clay pizza oven to be built during a series of volunteer days and workshops over the next 2 months. A 2 day workshop will be held 24th & 25th February to construct the clay oven, followed by a pizza party in March once the clay has hardened. These workshops are open to all ages with a particular emphasis on teaching new skills to Llanidloes young people. 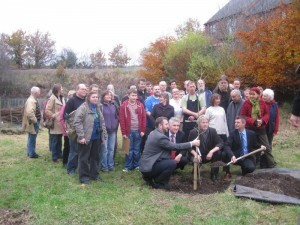 During November RWE Renewables donated time and money to build terrace beds which Llanidloes Level 2 gardening students have now planted with fruit trees awarded by Powys County Council Nectar Tree Scheme. These trees have been grown locally by Gareth Davies of Old Chapel Nursery and will be trained as espaliers so that they do not cast shade over the neighbouring houses. Emma Maxwell local horticulturalist and trainer will be delivering a fruit tree pruning course on the 15th Feb 2014 for anyone who has their own orchard or is interested in growing fruit trees. Regular volunteers Rhys Williams and Brian Marsh have been busy on Mondays planting a bed of strawberries that were donated by local residents along with fruit bushes and other perennial food plants. 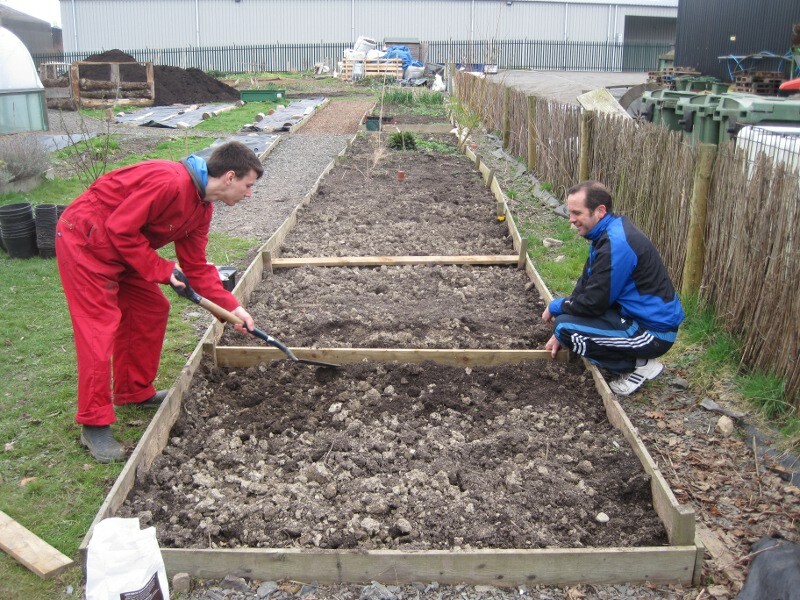 Space is available for micro allotments so that local people can have a go at growing food crops and enjoy the harvest for themselves. These small plots can be amazingly productive and allow you to Get Growing without it becoming a chore. Now is the time to get busy preparing gardens for the coming year by building structures, planting perennial plants and planning your summer vegetable growing. On Monday 27th January we will be launching the micro allotments and anyone interested in Getting Growing should join us at 11 O’clock for enrollments and a cup of tea. Weather you have never gardened before or you have lots of experience there lots of fun to be had and always more to learn. Get involved in community growing or enroll on a course or workshop with the Cwm Harry Cultivate team and Get Growing. 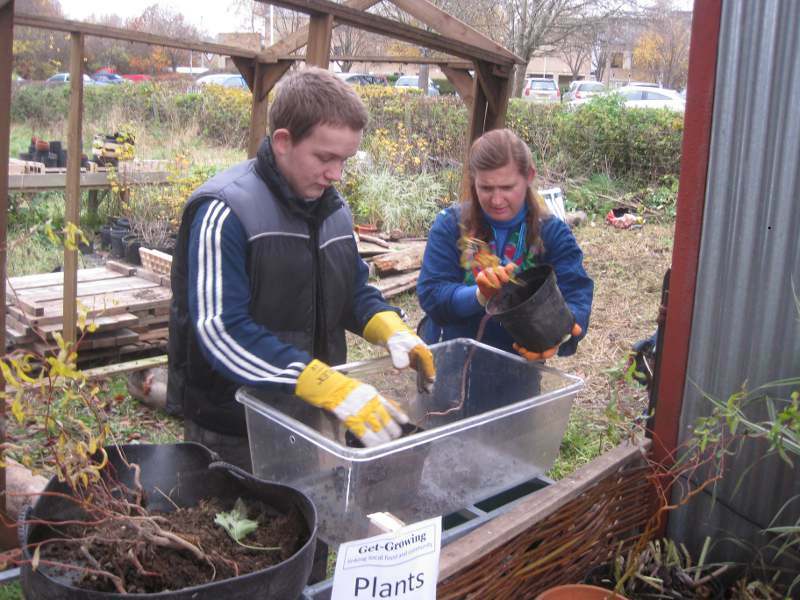 If you have any plants you wish to donate, you want to get involved in volunteer or have your own micro allotment, please contact Emma Maxwell for more information: emmam@cwmharry.org.uk. Interviews will be held on Monday 16th December 2013. 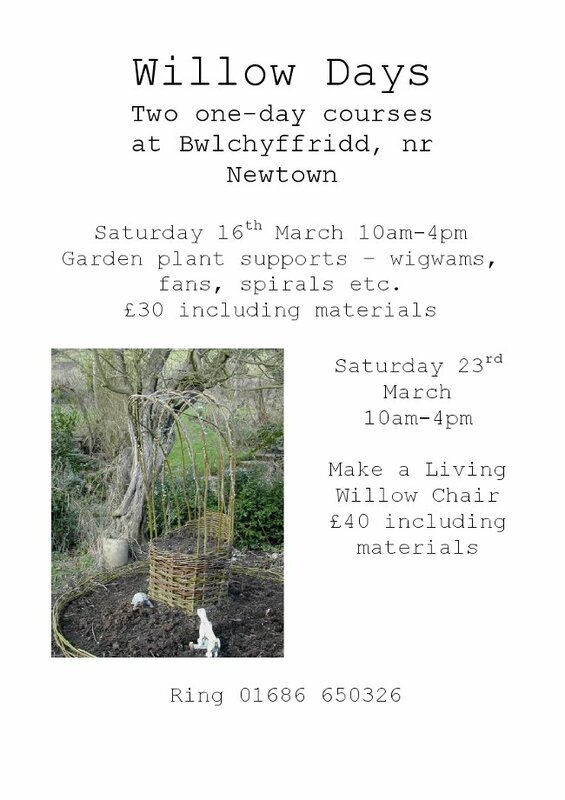 Local gardening writer Sue Stickland has asked me to pass on info about these 2 1-day willow workshops coming up in March. Willow is an incredible and versatile material to work with, from basketry to bean climbers and even living structures the possibilities are endless. These will be lively, fun and practical workshops, highly recommended! This is becoming a regular annual event for us.. and will link into a seedling swap in May. Saving seed is the foundation of food security and protecting and adding to biodiversity. 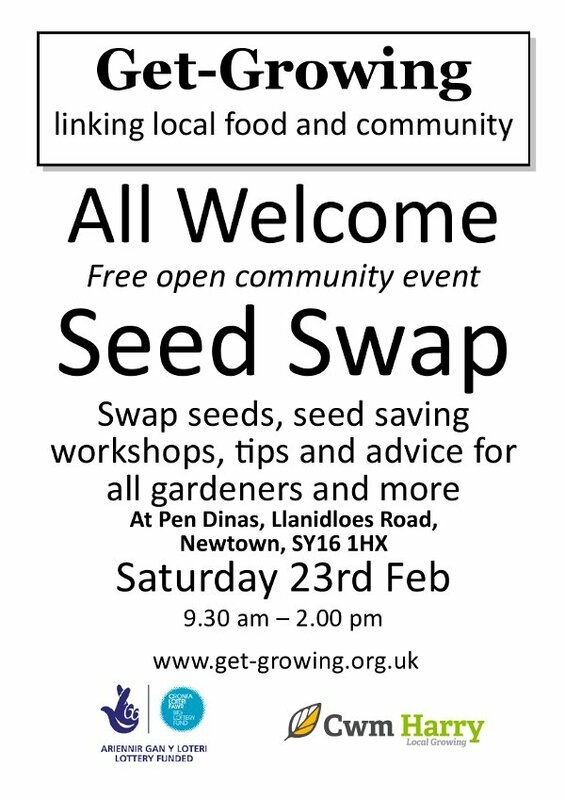 We will be offering workshops and tips on seed saving as well as having lots of seeds available for swap or donation. If you are in any doubt about how important seed saving is and the role of organisations like Heritage Seeds library then do watch the video posted earlier.. Seeds of Change. Community gardens such as the one just launched in Newtown this week could provide at least a partial antidote to the economic blues of the wider World. A key idea of our times is that of resilience, the ability to withstand external stresses and strains. The term really comes from ecology, as in the resilience of ecosystems, but it can be a useful term to understand the potentials of communities and local economies. Food and energy costs are rising, the wider economic situation is looking increasingly unpromising and all this uncertainty can be especially worrying when looking at the longer term prospects of the up and coming generation. 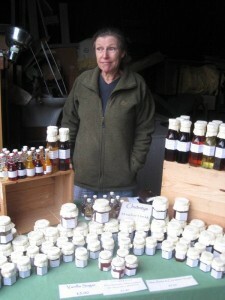 The Get-Growing philosophy is that we can at least create a bottom-up, community-led response which, although not able to resolve these issues can at the very least offer a degree of resilience by building a stronger more localised food supply and as a result a more interconnected local community around it. A real and tangible sense of community stems from having things in common and one of our core aims is to support the Newtown community to turn its underused spaces and neglected corners into productive and useful spaces from which everyone can potentially benefit from and can interact with. When the Cwm Harry food waste recycling plant/ compost factory on the Vastre estate shut down, as the Cwm Harry community garden we became the inheritors of its legacy. That being the final batch of high grade compost produced from Newtown’s own food waste and hedge trimmings, all ten tons of it! Cwm Harry only ever had the intention of creating a community interest company that could spark positive change locally and it achieved that by intervening in the waste stream and learning how to pull out potentially valuable materials that could be turned back into useful and valuable resources. Food waste into nutrient rich compost, pure organic energy, the new black gold! Now it is our challenge to turn that compost into force for community development, to use it to turn unproductive dead urban spaces into productive areas that we can all learn from and benefit from. By working closely with schools, community and other groups to unleash that potential energy then there is the ability to create local jobs and local revenue streams from managing, processing and retailing the resulting produce. Framed in an acedemic innovation/ job creation/ personal development/ work experience context then this is a process that can generate produce as a bi product of education, of community and personal development objectives. Big ideas, big ideals but it all starts with planting a tree, creating a possibility whilst inviting the community to take part in shaping it to meet the needs and opportunities of the locality. Lets Get-Growing! Watch out for Ash die-back..
We are of course alarmed and concerned to hear for the arrival of thsi fungal disease of ash trees. So far it has only been spotted in isolated cases on the East coast of the UK, but it can spread and we are advised to look out for it. It is entering the UK from mainland Europe and has already killed up to 90% of Ash trees in countries such as Denmark.Whether that 10& survival implies genetic resistance remains to be seen. We will sorely miss the Ash tree were it to go the way of the Elm. This spring we linked up with the Big Biochar experiment, where we planted up some test beds to make some comparisons with different soil treatments. 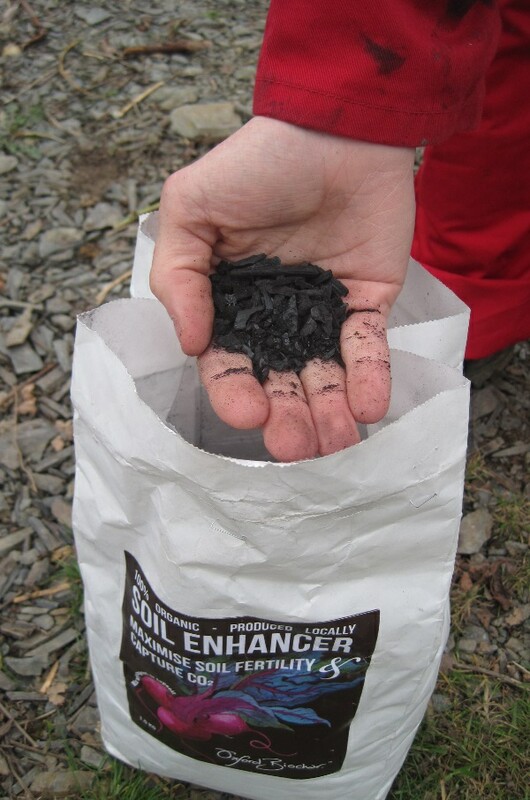 Anyone who doesn’t know about Biochar needs to look into it and find out some more. A good place to start is with this remarkable Horizon documentary which gives an historical and cultural context as to where the idea originates from, deep in the Amazon more than a 1000 years ago. Evidence suggests there actually were vast civilizations living in the Amazon, pre 1531 which is when the Spanish first arrived. It is a remarkable chapter in history, almost completely frogotten and the only tangible evidence of this once great civilization is the quality topsoil they left behind, in an area notorious for its poor soils for farming. Alternatively read Albert Bates’ excellent book, the Biochar Solution.. either way it so turns out that this could be the single most important discovery for centuries! It offers a clean source of energy as well as a potential response to combating climate change, soil depletion and food security. Maybe this is the way to sequestrate carbon from the atmosphere and put it back into the soil in a useful way. So if it is so potentially great as a growing medium then it certainly needs to be tested. Bed 1, 1KG of biochar was added as well as a wheel barrow of compost. Bed 2, We added nothing but there had been compost added the previous year. Bed 3, We added one wheel barrow of compost. Bed 4, Had a mineral dust based soil improver added and one wheel barrow of compost. 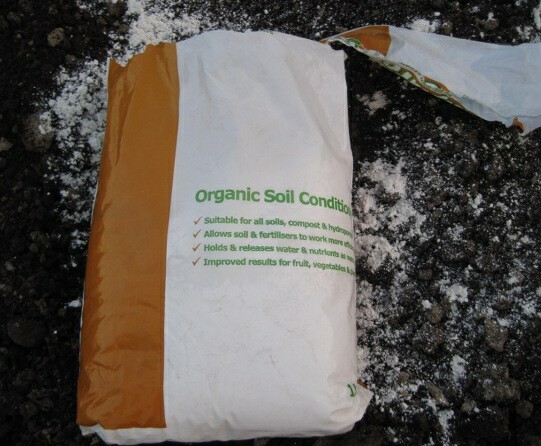 The compost was Cwm Harry soil improver and is homogenised and pasteurised high nitrogen food waste compost produced from local sources. Due to us having to move gardens and other distractions we didn’t measure the salad and beetroot yield, although visibly there seemed to be a clear improvement in beds 1 and 4. 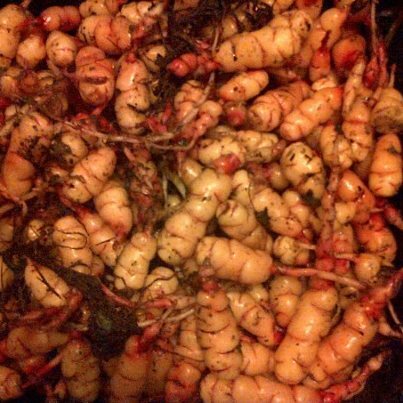 Bed 1: 1.84 KG of tubers… healthy plants but small tubers than bed 4. Bed 2: 1.34 KG of tubers… these were the smallest tubers in size but there were lots of them. 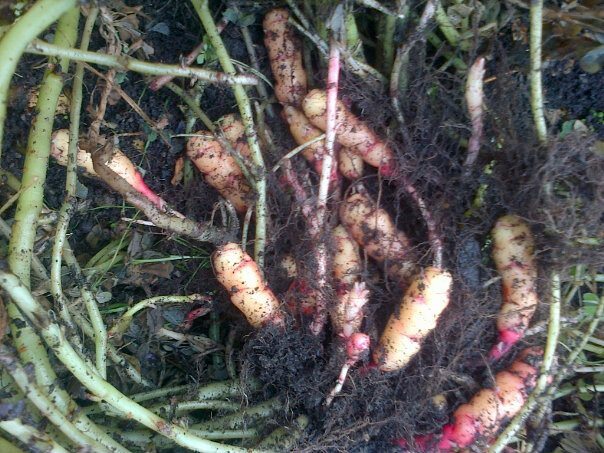 Bed 3: 1.54 KG tubers… actually very similar to bed 2, plentiful but quite small tubers. Bed 4: 1.52 KG of tubers… These were the best looking and largest individual tubers, but the total yield was less than bed 1. So in terms of overall crop the Biochar bed won.. but it was interesting to note that the rock dust treatment bed, Bed 4 had produced bigger and better looking tubers. Conclusion; I can’t wait to build long term beds using the compost, the rock dust AND the biochar. The results could be frightening! 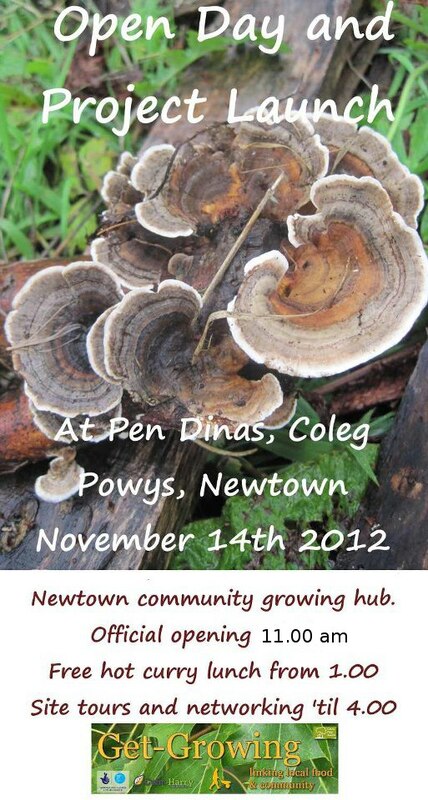 We have only just moved in at Pen Dinas, the new Get-Growing community garden hub in Newtown. Since moving there late summer from our previous base at the Cwm Harry compost factory on the Vastre estate. In the weeks since August we have finally been able to make a real start at our new base and the place is starting to feel like home. We have a fully consulted design in place for the 21/2 acre plot and have been busy digging up trees and taking down sheds from the old garden and moving them to the new one in readiness for building a new garden. We have also started working with our first work experience students, Zak and Jono, who will be with us one day a week for a full school year. We have also started regular work experience days with first-year college students on a 7 week cycle. Get-Growing is also developing an opportunity for 6 month horticulture and permaculture apprenticeships, for under 25’s, not currently employed or in education.. about which we will have more information available soon. We still have our volunteer Wednesdays, each week, where we focus on developing the new garden as well as seasonal gardening tasks. 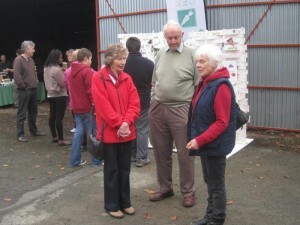 We have also hosted visits from a wide variety of student groups, community and other interested people. Get-Growing has also just started working with Treown community to develop a small toddler-friendly garden on the estate there. We are really excited about the coming year and the possibilities of working together with like minded groups and individuals. Please do come along if you are interested in any of these kind of themes. PS Chris is making a curry, but when it has run out, its run out.. so come early if you fancy a taste. 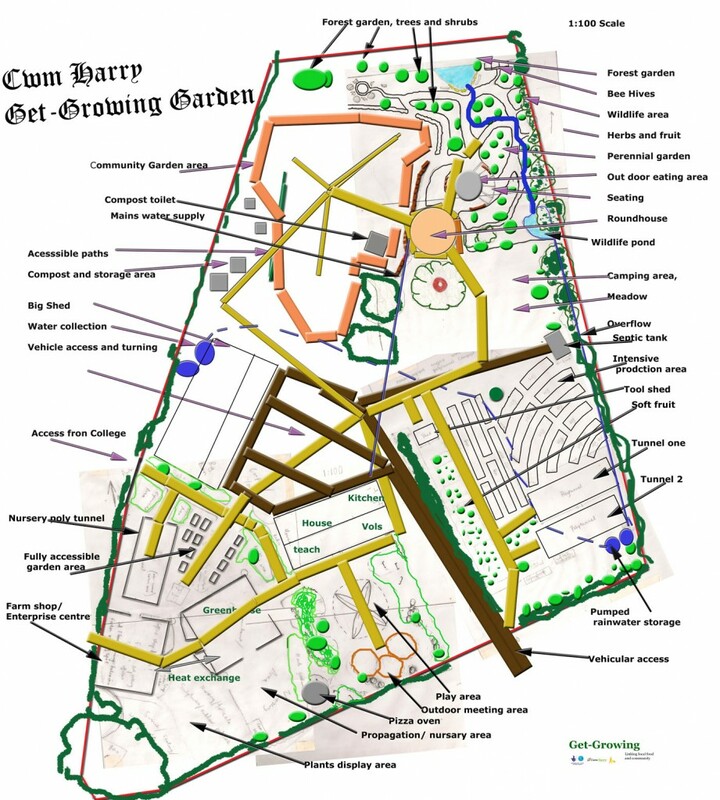 I have managed to collate all the design ideas and input the main ideas that came from the Community Garden Design course into a draft base map. Big thanks to everyone who helped put this together we are really pleased with the outcome and cant wait to get started on the garden itself. It is going to be a bit slow as there is now building work planned for the house but now that we know where the main elements are going to go we can start moving plants from the old garden and mulching areas in anticipation. We are part of the Cwm Harry's Cultivate enterprise. 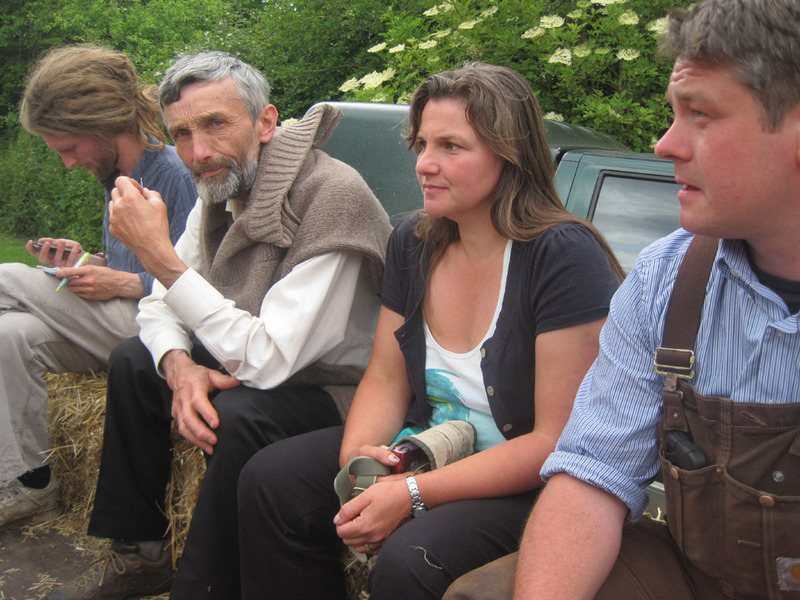 A Permaculture Design Course is a 72 hour learning experience that will change your perspective, help turn your convictions into actions and work creatively with change. We host and develop websites for third sector organisations and sustainable businesses. Wwoof, Work on organic farms.